Where does the year go? Whoosh - there it goes, straight past your face in a flash and before you know it, it's a new year. 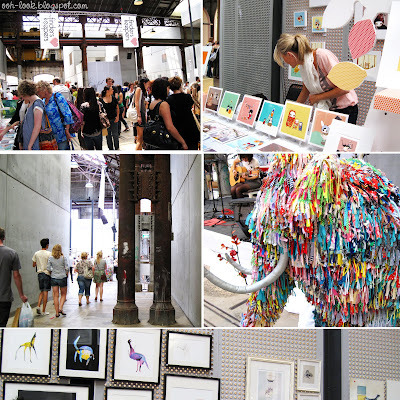 It seems like last week that I visited Eveleigh Markets, but it was probably earlier this year. A return visit was in order a few weeks ago because the twice-yearly Finders Keepers event was on at the same time at the same place. But more on that later. 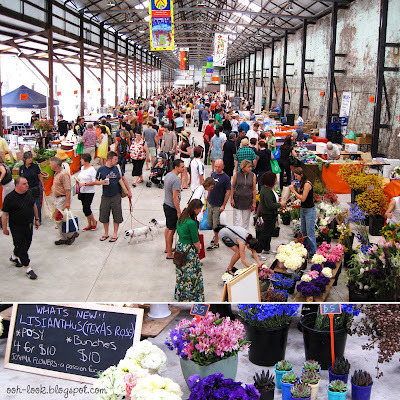 Eveleigh Markets are held each Saturday in a large open shed beside the railway lines near Redfern Station. 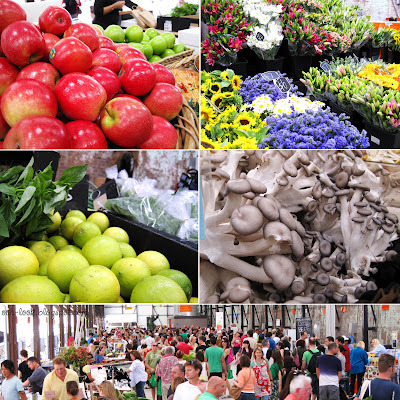 There is all manner of fresh farm produce - fruit and vegetables, artisan breads, cheesemakers and their wares, colourful flowers, a plant man, gourmet meats, it's all there. It's good that the market is held under cover, as it's on even when it's wet. The summer fruits and flowers are particularly abundant at this time of year, as are the pre-holiday shoppers. Notice the shimeji mushrooms above - the grey tones are reminiscent of a colder, more dismal climate, but they are so picturesque. The apple grower had golden apple pies for sale, adorned with sprigs of Christmas bush. There were also heirloom tomatoes available - I didn't get any though I'm regretting it as they'd be perfect in a summer salad, dressed with a tangy vinaigrette. And isn't the basil just gorgeous. 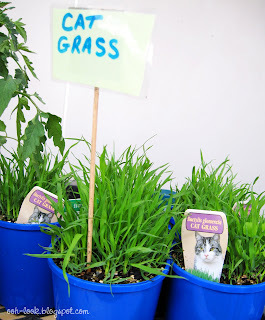 The main reason for visiting Eveleigh this time was to pick up some more cat grass for Tabitha. She enjoyed her last pot so much that when it ran out (ie. died) she resorted to eating the liriope leaves that grow on the side of the garden. So we got a new one for her ($3 per pot). 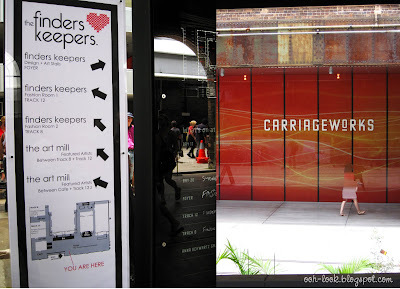 When we'd finished at the food/produce section, we strolled across the path to the Carriageworks building, where the Finders Keepers market was on. This event is for new designers and artists to show their works, and is filled with gorgeous accessories, artworks, fabrics, clothes and jewellery. There were around 80 stalls this time around, and it's a fabulous place to pick up unusual trinkets and gifts. The next Sydney market is not till next year, and there is also a Brisbane market soon. All up, it was a productive, feelgood type of day. And of course, Tabitha cat just adores her new cat grass. 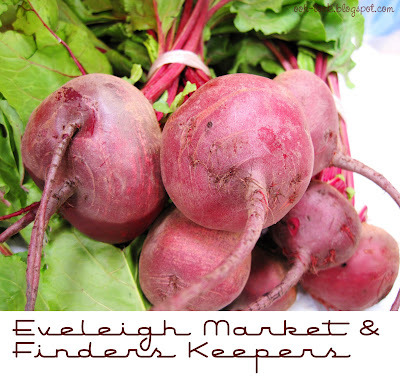 Eveleigh Markets are at 245 Wilson Street, Darlington NSW, about 10 minutes walk from Redfern Station. 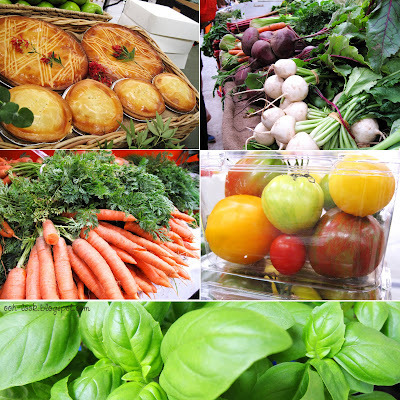 The final markets for 2009 are on this Saturday 19th Dec, and they will have a Christmas theme, with hampers, etc. And I was always told that cats only ate grass when they were sick...so what is it that Tabitha likes about cat grass quite so much? Love these markets. Cute cat too! hehe Tabitha looks so cute! Great collection of photos, the freshness smacks you in the face. Or is that the end of the year as it whizzes past? Lovely pictures and good write up. I haven't been to this market but love to read about it. Is this place very far? I have always wanted to go here - let me know next time you go and we can go together! 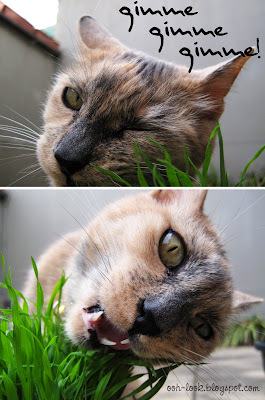 hi mlle delicieuse - Cats eat grass to aid their digestion. I think Tab likes the taste, too - she can't get enough of it! hi Anita - good shot showing her sharp little teeth, isn't it?! hi Food.4.two - it was pretty busy that day with the 2 markets on. I think we must have passed each other, too! 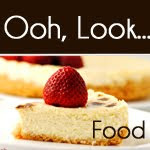 hi Justin - it's a shame the winter can be so drab, but all the more reason to stay in and cook up all sorts of warming goodies! hi Lorraine - I wish the Finders Keepers was on more often. I'll definitely go again next year. hi Ellie - it's a great place to pick up a range of foods. It's a comfortable place to shop, too. hi Trissa - I normally catch the train to Redfern, then walk there. We should definitely go together some time! hi YaYa - I'm glad you got to the markets, finally! How did the tomatoes taste? I was wondering if the green ones tasted unripe, or if they were like a red tomato? Oh I so wanted to go to Finders Keepers. Would've made an excellent Xmas shopping stop too - but sadly missed out this time. I wanted our cats to like cat grass/catnip, but they're not interested. We get a much better response when we bring bbq chicken home! I love open markets...lots of interesting things to see which you don't get in shops. hi Forager - I tried growing catnip but it never even sprouted. I can imagine that your cats would love bbq chicken, all the neighbouring cats would show up here if I served it! hi Adrian - oh, yes, you have to get some for Creamy, and some catnip, too! hi Maria - LOL! Tab will eat *anything*, including lawn grass. I think cat grass might be better for her, though. hi MaryMoh - yes, it's a shame the local supermarket doesn't have even half the stuff at grower's markets. At least it gives us something to do on weekends, eh?